KEY: Cut Broom in Bloom at ground level, while broom is in bloom, usually mid-April through early June. The drought stressed plants will die in the summer’s dry heat. Details below. Here are TWO DOCUMENTS for downloading. Share these documents and post in elevators, office spaces, bulletin boards. Cut Broom in Bloom. Cut at ground level, or below if possible, while broom is in bloom – in late April or May. The drought stressed plants will die in the summer’s heat. Why Cut in the Spring? The Scotch broom plant is most vulnerable when in bloom, because the energy of the plant is above ground in the flowers. If cut at ground level, while in bloom, the plant usually dies. If cut during the wet season, it will most likely re-spout. If cut in the spring, you do not need to remove the roots; the plant will die in summer’s dry heat. Why Cut at Ground Level? You need to find the single stem of the plant. No matter how many branches and sprigs there are, there is always only one “trunk” that goes into the ground. THAT is what you want to cut. Sometimes you have to move grass and give a tug on the stem to find the base of the plant. You want to cut all the way at ground level for two reasons. 1.There are often small branches that go off into the grass. 2. There are buds near the base that can resprout. You want to cut below those buds. This is a widely recognized strategy with invasive plants. Go after the small infestations first, eliminate the pioneers, and take down new stands. Start at the outer edges of larger infestation to stop the spread, and move towards thecenter. You will be drawing a line and saying – the BROOM STOPS HERE. Eventually you’ll be able to get to the dense areas and you CAN succeed. What about small plants or plants too big to cut? You can often pull small broom plants without disturbing the soil. This is best done in the wet season.Pat down soil around the plant. Broom can be huge – with a trunk 4 inches in diameter! Don’t be discouraged –big broom dies easily.All you have to do is cut off all the greenery and manageable branches, and the big broom plant dies. Again, cut off any branch that has needles, and any branches that you can cut without hurting yourself or your tool. The plant will die. Broom is a woody weed, and a saw cuts through quite easily. During the dry, hot summer, almost all larger plants die. The medium and smaller ones may regrow, but they will be weakened, and you will be able to find them easily when they bloom next spring. Broom needs sun, and broom seeds sprout in the sun. So broom thrives in disturbed soil. If a broom plant bloomed nearby the previous year, there are thousands of seeds already in the soil ready to sprout. A single broom plant can produce 18,000 seeds that are viable in the soil for 20-40 years! So if you disturb or destroy the ground cover, the seeds will germinate. Then, instead of one large plant, you will have 50 new seedlings. Keep the ground cover, grass and trees. Just cut, pat down the soil and cover with the ground cover. Smile and move on. Replant grass or other plants when possible. If the plant did not die by cutting one year, cut again – closer to the ground. Usually less than 25% of cut broom returns, often even less. Regardless, don’t worry. Check your method, and cut them again. Did you cut low enough to the ground? Did you miss side branches in the grass? If seeds sprout, pull the tiny plants out by hand.As the ground cover thickens, you’ll get fewer broom seedlings. Plant grass, allow ground story plants to take over, and plant trees. If you keep cutting in the spring, and encourage regrowth of native or cultivated plants, eventually the broom will give up. After the first year, it isn’t really hard, but it does require attentiveness. Soon the native plants will thrive again. If broom is blooming near an uninfested area, be sure to cut off all yellow flowers to keep seeds from entering the uncontaminated soil. This applies especially if you are cutting trees, clear cutting or tilling. Keep the seeds from spreading. What to do? Call your friends. Arrange pick up, with Broombusters or your neighborhood or town. Pick a day in April or May. Put on a vest, gloves and strong shoes. Pretend you are 10 years old, and go out and have some fun! 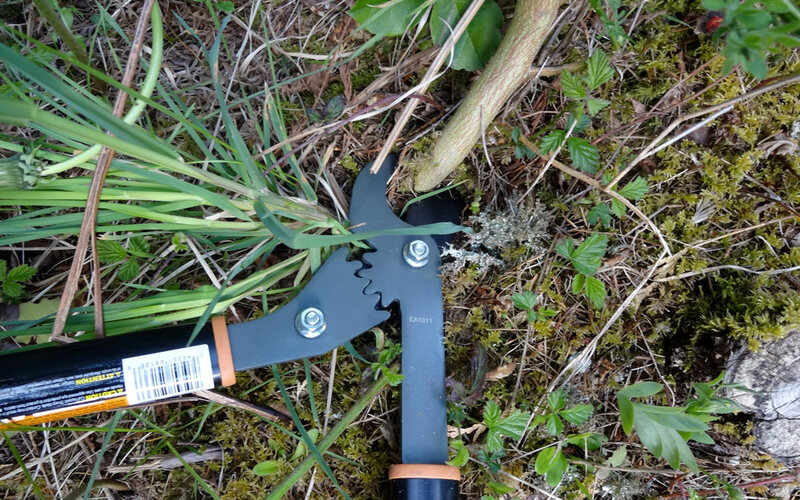 Cut the broom with loppers at ground level or slightly below. Tap down soil around the roots.Enjoy the fruits of your labor for years to come.